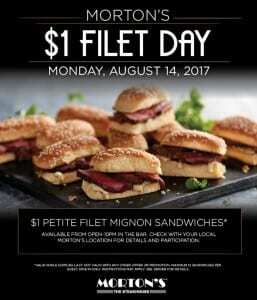 Morton’s $1 Filet Day is Monday, August 14, 2017 with Petite Filet Mignon Sandwiches for $1 each available all day from 10AM to close. Keep in mind that these Filet Mignon Sandwiches are small and you may need to order more than one. There is a limit of 12 per person and available at the bar only, while supplies last. Make sure to ask your server about the details before ordering. Morton’s Steakhouse is located in Boston at Two Seaport Lane in the Seaport District, however, there are locations all across the country that participate in the deal as well. For more information about $1 Filet Day at Morton’s Steakhouse, please head here. Yum! Will you be grabbing a Petite Filet Mignon Sandwich for a $1 on Monday?